Japan, once a miracle growth story known as the land of the rising sun, has found itself mired in a stagnant no-growth world for over 20 years. During this time, they have accumulated massive debt and now have demographics making them the oldest country in the world. These forces threatened the stability of Japan’s ability to fund their spending and social programs as their rapidly aging population struggles with staggering debt. As the sun looks poised to set on Japan amidst a crushing debt load, unique opportunities arise for astute investors. What is informative about Japan is that it represents the front edge of where the entire developed world, including Europe and the US, is heading - into a dangerous cycle with too much debt, aging demographics, and gross overspending supported only by the sheer printing of money. No other major world economy has as much risk of a debt crisis and resulting inflation due to a falling currency as Japan. Despite years of deflation or falling prices, Japan is on an aggressive path to weaken the Yen and spur inflation as part of official policy. Pushed too far, this could spiral into a state of high inflation as investors wake up to the realities that Japan has reached what is referred to as the "Keynesian End Point". This is a point where non-discretionary spending exceeds tax revenues, leading to money printing as the last tool at the disposal of policy makers. According to Hinde Capital “if Japanese yields returned to levels of the mid-1990’s (i.e. 5 year bonds at 6%), the entire tax income of the Japanese Government would be spent on debt servicing”. Japan’s official debt already exceeds 200% of their annual production (gross domestic product). This has only been possible given their extremely low interest rates. Academic research has shown that most countries face funding issues when they approach 100% debt to GDP. How did Japan get in this position? In the wake of their real estate and stock market bubble in the 1980’s and subsequent crash, they have spent beyond their means to keep their economy afloat, albeit in a sideways zombie-like state. Analysts such as Dylan Grice (now of Edelweiss Holdings) have argued that Japan may have spent money in a futile attempt to offset the inevitable forces of an aging demographic base with increased social costs. Japan’s fertility rate stands at 1.2 children, well below the population-sustaining 2.1 child replacement rate. Their lack of immigration also makes their demographic situation more dire. Today, Japan has as many retirees as those working. Given their predicament, many are puzzled how interest rates in Japan have remained so low. Part of the story is that the buyers of Japanese bonds have been loyal Japanese investors who actually were more rewarded in bonds the last 20 years than in Japanese stocks or real estate. However, a good investment the last 20 years may prove to be a terrible investment the next 20, as we suspect. Over the last 20 years, savings rates have fallen from the mid-teens to almost nothing today, so Japanese investors are largely tapped out. Also, Japanese bonds today have no built in expectation of expected inflation since it has not been a concern for decades. However, if inflation fears picked up, yields could jump and send Japan into a debt funding spiral. Given this, Japan will need to find outside buyers of its bonds. This will likely cause rates to jump since foreign investors will not be satisfied with the low rates on Japanese bonds. Japan ultimately has little choice but to continue printing money in increasing quantities to keep the system from collapsing. Despite this dire situation, investors should not ignore the opportunity to profit from these forces in Japan. We believe Japan may ultimately mirror a handful of historical cases where countries have transitioned from low inflation to high inflation or even a dreaded cycle of hyperinflation (where people lose faith in the currency). During these transitions, markets are often mispriced as the inertia of the past blinds investors to the new future ahead after an inflection point. Extreme cases of inflation are well documented in Weimar Germany and Zimbabwe, but similar episodes befell the US and France in the late 18th century. In more recent cases such as Zimbabwe and even Israel in the 1980’s, periods of high inflation led to soaring local stock markets. However, these incredible gains were more than offset by massive inflation from currency depreciation to the point of worthlessness, negating any benefit of owning stocks. Herein lies the opportunity: investors who can identify a country transitioning from subdued to high inflation would invest in the stock market of a country and then hedge the currency, resulting in tremendous profits if correct. Today, we believe investors have this opportunity in Japan. Owning Japanese stocks during a transition to high inflation may be rewarding if the falling value of the Yen can be hedged back to exposure in US dollars. 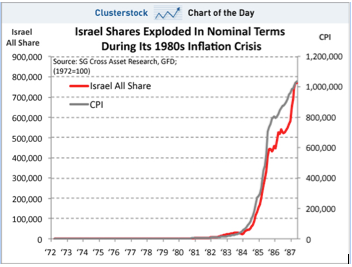 According to analyst Dylan Grice, if Japan followed the pattern of Israel during their period of triple digit inflation in the 1980’s, a $1,000 investment would turn into $6.5 million (a 6,500% return). Although this represents an extreme example, we advocate a small amount of capital dedicated to this opportunity for the potential of huge returns if even remotely correct. The problem with many high return potential investments is that they have equal downside risk. In this case, we think the risks are muted relative to attractive upside potential. Even if the thesis fails to materialize, investors are left owning Japanese stocks (still 60% of all-time highs) with price to book valuations near 1x relative to 2x for U.S. equities. Further, with currency hedged back to US dollars, Americans take on no currency risk. We have a simple way to execute this trade for clients, which should represent only a small fraction of their wealth. Although the sun is setting on Japan, the sun has yet to rise for investors positioned for the likely inflationary path ahead. All written content on this site is for information purposes only. Opinions expressed herein are solely those of WindRock Wealth Management LLC and our editorial staff. Material presented is believed to be from reliable sources; however, we make no representations as to its accuracy or completeness. All information and ideas should be discussed in detail with your individual adviser prior to implementation.